The World Meteorological Organization (WMO) says that the physical and financial impacts of global warming are accelerating. Record greenhouse gas levels are driving temperatures to "increasingly dangerous levels", it says. Their report comes in the same week as the International Energy Agency (IEA) reported a surge in CO2 in 2018. However, new data from the UK suggests Britain is bucking the trend with emissions down by 3%. This year's State of the Climate report from the WMO is the 25th annual record of the climate. When it first came out in 1993, carbon dioxide levels were at 357 parts per million (ppm) in the atmosphere. These have now risen to 405.5ppm and are expected to increase further. This is having a significant impact on temperatures, with 2018 the fourth warmest year on record, almost 1C above what they were in the period between 1850-1900. The years between 2015 and 2018 were the four warmest on that record, the study says. "This report makes it very clear that the impacts of climate change are accelerating," said Prof Samantha Hepburn who is director of the Centre for Energy and Natural Resource Law at Deakin University in Australia. "We know that if the current trajectory for greenhouse gas concentrations continues, temperatures may increase by 3 - 5 degrees C compared to pre-industrial levels by the end of the century and we have already reached 1 degree." While some of these figures were published in a preliminary release of the study from last November, the full version has data on many key climate indicators, that the WMO says break new ground. One example is ocean heat content. More than 90% of the energy trapped by greenhouse gases goes into the seas and according to the WMO, 2018 saw new records set for the amount of ocean heat content found in the upper 700 metres of the seas, and also for the upper 2,000 metres. Sea levels also continued to increase with global mean sea level rising 3.7mm higher in 2018 than the previous year. "This report highlights the increase in the rate of sea-level rise, and this is a real concern for those living in low-lying coastal areas, for both developed and developing countries," said Dr Sally Brown, a research fellow at the University of Southampton. "We know that sea-level rise is a global problem that will not go away, and efforts need to be made to help those who are really vulnerable to adapt to sea-level rise or move to safer areas." According to the report, most of the natural hazards that affected nearly 62 million people in 2018 were associated with extreme weather and climate events. Some 35 million people were hit by floods. Hurricane Florence and Hurricane Michael were just two of 14 "billion dollar disasters" in 2018 in the US. Super Typhoon Mangkhut affected 2.4 million people in and killed 134, mainly in the Philippines. 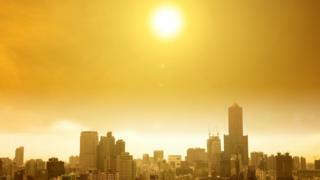 More than 1,600 deaths were linked to heat waves and wildfires in Europe, Japan and US. The head of the WMO say that the signals of warming continue to be seen in events since the turn of the year. "Extreme weather has continued in the early 2019, most recently with Tropical Cyclone Idai, which caused devastating floods and tragic loss of life in Mozambique, Zimbabwe and Malawi. It may turn out to be one of the deadliest weather-related disasters to hit the southern hemisphere," said WMO Secretary General Petteri Taalas. "Idai made landfall over the city of Beira: a rapidly growing, low-lying city on a coastline vulnerable to storm surges and already facing the consequences of sea level rise. Idai's victims personify why we need the global agenda on sustainable development, climate change adaptation and disaster risk reduction," said Mr Taalas. The report has been launched at a news conference in New York attended by the UN Secretary General Antonio Guterres. "There is no longer any time for delay," he wrote in a foreword to the new study. However earlier this week the International Energy Agency published worrying data, indicating that in 2018 carbon emissions were up 1.7%, as a result of the fastest growth in energy use in the last six years. The UK government has also released emissions data about greenhouse gas emissions over the past year. The figures show that emissions across the UK have fallen by 3% over the last year, the equivalent the government says, of taking 5 million cars off the road. Factors driving UK emissions down include the fact that coal was the source of just 5% of electricity in 2018. The government now says that carbon emissions are at their lowest level since before the turn of the 20th century, when Queen Victoria was on the throne. Follow Matt on Twitter @mattmcgrathbbc. The Turpin children tell a California court they still love their parents as they are jailed for life.